Today I decided to travel light to my 9:30 AM class, so I left the backpack at home and walked to school with my folder, book (La familia de Pascual Duarte), cell phone, keys, iPod, and wallet. Walking up the hill without the added weight of my backpack (that probably weighs 5 lbs. when empty) was really nice. It was even better at the end of class when I didn't have to pack up, but could just stand up and walk out. The problem is that I have a tendency to unpack my pockets when I sit down. I can't stand having keys, phones, iPods, chap stick, or wallets on me when I don't have to. When I got to class today, I left my phone and iPod in my coat pocket, but I put my wallet on the floor under my chair. When class ended, I got up, picked up my coat, folder, and book, and left the classroom, leaving my wallet behind on the floor. I didn't realize I had forgotten it until I got home, when I decided I wanted to get something to eat and needed my wallet to buy it. I searched my room, not knowing if I had just misplaced it at home, but could not find it. I then walked back up to campus to look in my classroom, but there was a class in session, and I did not want to be like the girl that came into my D&C class a while back and stopped the whole class so we could all look under our chairs for her phone. When no one could find it, she gave her number out, and a couple of guys all raced to be the first one to call it. She found her phone, and gave out her number to a bunch of guys. I didn't want to repeat that process with the class sitting with my wallet under one of their chairs. If they found it, they would probably look at my drivers license or ID, both of which have terribly embarrassing pictures. Anyway, I didn't go into the classroom, but I did go to the lost and found. No luck there. I went back to the classroom after my 1:00 PM class, but there was another class in session. Still avoiding embarrassment, I came home. I checked my email, and there was one from my professor/dean. He had the wallet in his office. If only I had gone there at 11:00 AM, when I was desperately searching. I know that purses are not socially acceptable for men, but something must be done. I'm not about to strap my cell phone to my belt, and even if I did, what would I do with my keys, wallet, and iPod (all of which must be carried constantly)? I need something accessible, acceptable, and practicle to prevent any future wallet-losings when I empty my pockets. I am disappointed that no one in my family has posted a Thanksgiving blog. I've been checking EVERY day, and nothing... Come on! 1. In high school when I needed a break from homework, I would take my Civic out and race it through the hills around Skyline Drive. That's where those brakes and tires went, dad. I thought I was the real Michael Andretti. 2. My friend Amanda and I used to follow people in their cars (that we knew from school but who didn't know it was us) until they would either freak out because they were being followed or play a car version of tag (also, that's where those tires and brakes went). 3. When Amanda got her new car with 4-wheel drive, we took it out into a muddy construction lot and played in the mud until her car got stuck. So her mom wouldn't find out, we first called a friend with a Jeep and a wench. When that didn't work, we called AAA, and they pulled her out. The car was covered with mud (inside and out), so at about 1:00 am, we went to the car wash and tried to spray all of the mud off. For months after that, every so often we'd be driving along and clumps of dirt would fall off and bounce behind the car. Her mom never found out (as far as I know). 4. One day after a choir concert, I went to Del Taco with James, Amber, and Amanda. We went inside to order the food. Amber and I were the first ones to finish, so we took Amanda's keys, and I got into the driver's seat, and Amber took shotgun. Amanda and James then came out, and she sat behind me, and James behind Amber. We pulled out of the parking lot onto Rose (my license was still provisional, meaning I wasn't supposed to have passengers in the car with me while driving) and the light was red at Imperial. While we were waiting for the light to change, James suggested we open the doors and let them close themselves as we accelerated. The light turned green, I floored it, the doors shut, and then the sirens turned on and the lights flashed in my rear-view mirror. The cop came up to my (the driver's) window, asked me what I was thinking. I said something dumb, and then he asked whose car it was. I pointed at Amanda, and after questioning her at her window, asked her to step out of the car. The cop gave her two options: either take a $100 ticket or he would call her mom. She didn't want either, and managed to talk her way out of both. 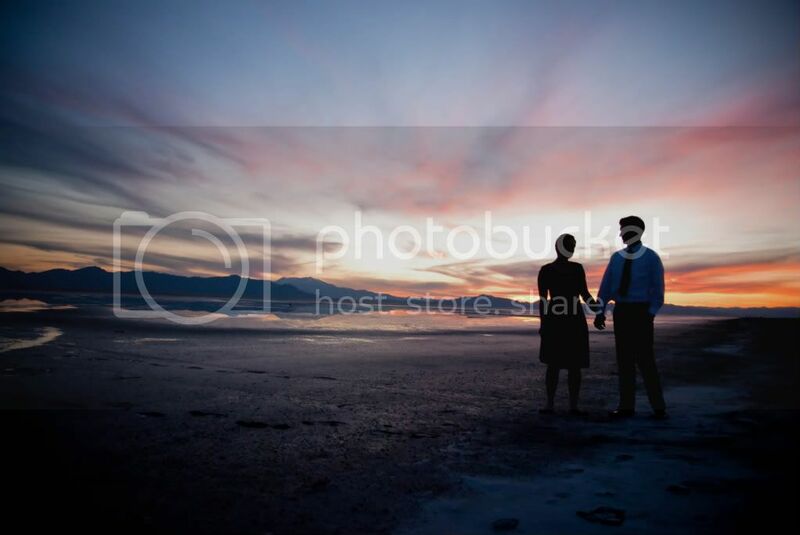 She said, "I'm a good girl, I get good grades and I'm a Girl Scout, and he's a good guy, he's Mormon, and a Boy Scout..." She was out there with him for what seemed like forever, but it worked, and none of our parents ever found out (until now). We went back to my house, we walked in the door, and we all hugged each other and fell on the floor with relief. It seemed so bad when I was 17. 5. Landon, Alan, and I used to call ourselves the Citizens Auxiliary Police. Landon had a stupid red flashing light that plugged into the cigarette lighter. We would wait by obscure stop signs for people to blow through them. When they did, we would plug in the light and chase them down until they stopped. We would then give them a friendly reminder not to blow through stop signs in obscure places. (I can't believe I'm telling this.) Luckily, the real "po-po" never caught us. 6. Another time, Landon, Alan, and me were driving by the Church late at night, and we noticed a car parked in the back of the parking lot. Being the Citizens Auxiliary Police force, we decided to check it out. We drove back there, and realized that the windows were a little foggy. At that point, we became the Morality Police. I parked my car along side the questionable one, forcing the guy in the other car to hop out with his pants around his ankles. He cursed, I sped away, and proceeded to call our colleagues, the real police. Two cop cars showed up, but we didn't realize that the perpetrators had sneeked out. For a while, we thought something was going down in the parking lot, but we didn't want to go back there and find out while the cops were still doing their thing (for fear that they might think we, the Morality Police, were also up to no good), so we drove around to the back side of the parking lot where there was an ally connecting it to one of the other side streets. We couldn't see the cops from there, so we made Alan jump a fence (trespass), and see what was up. It was then that we realized the cops were just chatting and there was nothing going down. We then went home and watched a movie or something. 7. One time I was driving fast down Yorba Linda Boulevard late at night (Robyn knows this one), and apparently it was fast enough to make a cop car do a complete 180 at full speed. Luckily, I saw him and slammed on my breaks before he could get a good look at my speed. I am so glad that when the cops scanned my plates, it said (Uncle) Honda and not 17-year-old Michael Johnson. At the request of Devon, I tag him. He asked for it, so he can have it. These are the confessions of a reformed (somewhat) 22-year-old. I still drive fast, but I definitely keep the doors closed all the time. Who Waits For Thanksgiving Anymore? Took this last year after Christmas at the Loveless Cafe. So, I have to admit that I started listening to Christmas music in June. When I put it that way, I never really stopped listening to it. Christmas music is such a fiery debate topic these days. Some people love it, and some people absolutely refuse to listen to it 'til after Thanksgiving. Some might even lobby for a constitutional ammendment banning Christmas music from the airways until Turkey Day has passed. Well, I'm not one of them. In order to help you all get in the mood, I've put together a list of all my favorite Christmas songs (and albums). There are some traditional ones in the mix, but most of them are, like me, a little out of the ordinary. October was a good month. Too bad I didn't blog at all during its 31 magical days. First of all, I'd like to give a shout out to my very hot, not very 30 sister Kimberly. She is the greatest oldest sister I could ask for. I'm so glad she's holding on to her roots in California. She gives me the hope that there is life after college (and Provo). I love you, Kimberly. Happy belated birthday. Here we are at the light house in February '07. Now that that's over with, let's start with the update. Homecoming was a hectic week. I worked about 60 hours feeding all those people that think they're important. At the beginning of October I got sick, I had midterms, I was working about 30 hours a week, I started dating a girl, and I got called to be the new elders quorum president. Talk about stressful. Because of General Conference, stake conference, and who knows what else, I knew about the calling for two weeks before I was sustained, and had to wait another two weeks to be set apart. I finally got the quorum partially organized on Sunday, and am looking forward to NOT having to teach the lesson again next Sunday. Halloween was a GREAT night. I put off finding a costume for so long that I had to fall back on last year's costume. However, I think I improved it. 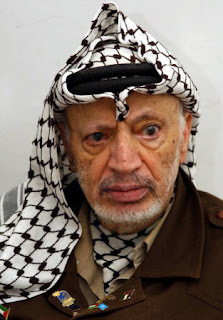 Last year I was Yasser Arafat. 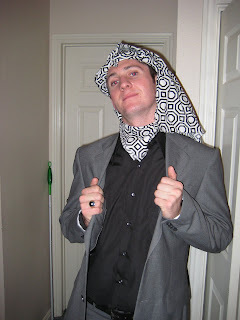 This year I was an Arab oil tycoon. Let's just say, I was the hottest thing this side of the Euphrates. Though I didn't take my camera with me to any of the parties I hit, I did manage to take some pictures when I got home. On November 2, I went with Marianne to the Regina Spektor concert in Salt Lake. I had been looking forward to it for a long time. She is a really original artist with quirky, innovative, and downright weird lyrics. At one point in the show she was playing the piano with her left hand, beating a bass drum with her foot, hitting a chair with a drum stick with her right hand, and singing. I really enjoyed the show. Click hear to see a video of the song she opened with. And yes, she's wearing a zip-up hoodie, a silver sequin dress, and really high leather boots. The doors opened at the venue at six, and Marianne and I didn't leave Provo 'til about 5:15. We made it to the venue at about 6:15, and then commenced our search for parking. There was no parking for a few blocks, and then I found a street with plenty of parking. I turned down the street, parked, and then got out of the car, only to realize that we were parked in "bum town," right down the street from a soup kitchen or shelter or something. All you savvy Salt Lakers will know right where I'm talking about. Since we were already running late, I didn't want to move the car again. I locked the car, and then pressed the remote lock button about five times, just to really make sure it was locked. Marianne and I then proceeded to the venue, passing coughing, swearing bums in "bum town" all the way. The funny thing is that it's right across the street from The Gateway. When we got back to the car after the concert, we saw flashing lights. Both of us thought that my car had been broken into or stolen, but neither of us dared to say anything about it. Luckily my car was in tact and visibly untouched. The police were simply arresting a woman for who knows what reason. Needless to say, it was a little awkward driving away with three police cars and a hand-cuffed woman right next to you wondering why the heck you parked in "bum town." Theme images by robtmichael. Powered by Blogger.